Dr. D. Scott Trettenero says some of the most exciting scientific discoveries in medical research have linked oral health to cardiovascular health. Recently, the specific bacteria from dental infections—including periodontal disease, abscessed teeth, and failing endodontics—have been proven to cause cardiovascular disease. An article published online in November 2016 by the Postgraduate Medical Journal and in its April 2017 issue—written by Bradley Bale, MD, and Amy Doneen, ARNP—demonstrates the pathways of specific bacteria from dental infections and how they directly cause heart attacks and strokes. Their article, “High-risk Periodontal Pathogens Contribute to the Pathogenesis of Atherosclerosis,” is a landmark publication that takes dental pathogens from an associated cause to a direct causal status of arteriosclerotic vascular disease (see figure 1). (1) From their research, the authors conclude that dentists now have the added responsibility of diagnosing and treating dental disease not only to help patients save their teeth and gums, but also potentially save their lives. The common denominator for all the risk factors for cardiovascular disease (CVD) is chronic inflammation of the arteries. It is now understood that heart attacks and strokes are triggered when a diseased, plaque-filled artery becomes so inflamed that the vessel wall is breached. This leads to the creation of a clot that obstructs blood flow to the heart or brain. (2) In simplified terms, this is now what is recognized as the cause of heart attacks and strokes. The prevention of these diseases mandates that the inflammatory processes are eliminated. Dr. Pessi’s studies—along with the clinical experiences of Bale and Doneen—help to prove that the oral-systemic connection is more significant than previously surmised. 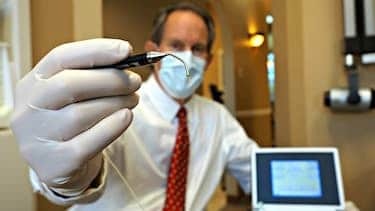 It is their belief that any patient who has suffered a heart attack or stroke deserves to be evaluated by a dentist who is knowledgeable in this area and who has the technical equipment necessary to properly diagnose these infections. As such, 3-D cone beam radiography is a must to accurately detect failing root canals and teeth with infections that may not show up on 2-D films. Bale and Doneen documented how many of their patients’ inflammatory markers were reduced after undergoing proper dental treatment for their oral infections. If inflammation was not present in the arteries, then patients were not at risk for a heart attack or stroke. (2) Dentists have a significant role in the prevention of these deadly diseases by eliminating dental infections. The rationale for watching asymptomatic lesions will be questioned once dentists understand how important their role is in their patients’ cardiovascular health. With this latest information, dentists will have an increased responsibility to inform patients that their lives may be at risk if they have infections of the teeth and gums. Family history of CVD must be noted as well as an understanding of the other risk factors that are easily detected by the use of a thorough health history questionnaire and patient interview. Since it has been shown that dental pathogens cause CVD, dentists must to be able to treat dental diseases with verifiable antimicrobial therapies. Dentists must also provide DNA testing for the specific types of bacteria that are causal for heart attacks and strokes in their diagnoses as well as postoperatively for verification of treatment results. (2) Currently, this can be done by companies that offer salivary testing for the various bacteria associated with periodontal disease and CVD (such as OralDNA Labs). Once diagnosed, treatment protocols need to be directed toward the elimination of bacterial pathogens. Microbiological therapies to treat periodontal disease include antimicrobial irrigation and antibiotics in conjunction with scaling and root planing. The Millennium PerioLase laser, for example, has been demonstrated to significantly reduce bacterial pathogens with the LANAP protocol. Home care can include prescription mouthwashes and custom dental trays with antibacterial gels. All heart attacks and strokes are potentially preventable with optimum medical and dental care, which includes correctly identifying and treating the root causes of patients’ cardiovascular disease. Dentists can now have a major impact in the prevention of CVD. In their book Beat the Heart Attack Gene: The Revolutionary Plan to Prevent Heart Disease, Stroke, and Diabetes, authors Bale and Doneen outline a unique, proven methodology that can help millions live longer and healthier lives. Dentistry will soon be called upon to develop predictable microbiological therapies and protocols to do its part in fighting this disease. The BaleDoneen Method for heart attack and stroke prevention is helping to lead the medical profession into an entirely new and exciting future of early diagnosis and preventive planning that will include dentists as a part of its interdisciplinary team. This book is an absolute must for all dentists, as it outlines how important these strategies can be to patients’ cardiovascular health. I recommend it to all of my patients who have had strokes or heart attacks, or those patients whom I believe are at risk based on their health history, exams, or interviews. Dentistry has been demonstrated to be a cornerstone in the treatment of arterial disease by Bale and Doneen, (2) and as such, we have now been brought into the fold of diagnosing and treating one of the leading causes of morbidity. Our skills and technology have been exponentially elevated in worth and status. Our dental services, including basic prevention programs, not only can have the goal of healthy teeth and gums, but also the prevention of life-threatening diseases. These two author/researchers have potentially initiated the beginnings of a new era for dentistry. When their new information becomes more mainstream, patients will likely have a greater appreciation of dental services with a higher acceptance of our treatment plans. We will be able to add new services to our treatment menus and create new profit centers as upgraded antimicrobial therapies and protocols are developed. Dentists will have the opportunity to become partners with physicians to treat and prevent CVD using new protocols in dental medicine. Read DentistryIQ‘s popular blog, “Making the Oral-Systemic Connection,” written by Richard H. Nagelberg, DDS. Click here to access all articles in the blog, and watch for new ones to come! 1. Bale BF, Doneen AL, Vigerust DJ High-risk periodontal pathogens contribute to the pathogenesis of atherosclerosis. Postgrad Med J. 2017;93(1098)215-220. Published online 2016 doi: 10.1136/postgradmedj-2016-134279. 2. Bale B, Doneen A. Beat the Heart Attack Gene: The Revolutionary Plan to Prevent Heart Disease, Stroke, and Diabetes. Nashville, TN: Turner Publishing Co.; 2014. 3. Fifer, KM, Qadir S, Subramanian S, et al. Positron emission tomography measurement of periodontal 18F-fluorodeoxyglucose uptake is associated with histologically determined carotid plaque inflammation. J Am Coll Cardiol. 2011;57(8):971-976. doi: 10.1016/j.jacc.2010.09.056. 4. Pessi T, Karhunen V, Karjalainen PP, et al. Bacterial signatures in thrombosis aspirates of patients with myocardial infarction. Circulation. 2013;127(11):1219-1228. doi: 10.1161/CIRCULATIONAHA.112.001254. 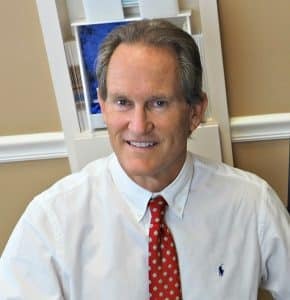 D. Scott Trettenero, DDS, has maintained a solo Fort Myers dental practice since 1982. He is the author of two books: Master the Mystery of Human Nature: Resolving the Conflict of Opposing Values and Unlocking the T-Code. He can be contacted at strettener@aol.com. I have become an Endorsed Provider for the Bale/Doneen Method for the prevention of heart attacks and strokes. of heart attacks and strokes.